The National Council of Hotel Management and Catering Technology (NCHM) JEE has been release the Bachelor of Science in Hospitality & Hotel Administration programmer’s application form uploading on official website. These applicants are searching the BSH applicants you can visit the NCHM Official website and download the notification after read the all application form then you can fill the NCHM 2019 JEE Application Form and online registration starting from 15th January 2019 and application submission form close on 15th March 2019. 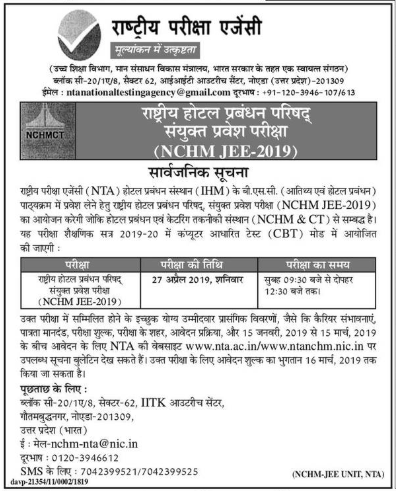 NTA will conduct the National Council for Hotel Management Joint Entrance Examination 2019 (NCHM JEE-2019) in CBT mode on 27th April 2019 for admission to the B.Sc. Course in Hospitality and Hotel Administration (B.Sc. HHA) across the Country. The NCHM JEE already issue the application form and this JEE submission form till valid 2019 so, you can visit the official website and download the submission form NCHM JEE 2019 Notification. These applicants are clear the Entrance Exam of NCHM JEE 2019 for more details eligibility criteria admission related already below here. Starting date of online application is 15/01/2019 and last date of form submission is 15/03/2019. The date of NHMCT JEE 2019 entrance test is 27/04/2019 (Saturday). Education Qualification:- The applicants must be clear the XII | 10+2 from affiliated Board can also appear in JEE 2019 on provisional basis Provisional admission will stand cancelled. Age Limit:- The Candidates must not be more then 22 Year. The National Council of Hotel Management and Catering Technology after conducting the JEE Entrance examination some time later 2019 declare the B.Sc Hotel test exam result on official website. After release the NCHM JEE Entrance Test we will update our website then you can download NCHM JEE Written Test Exam result 2019.